Zombie Skin: Let’s Bite ’em Back! Zombie apocalypse got you down? 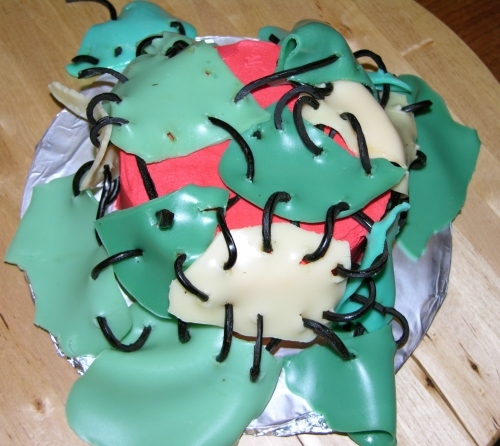 Hordes of the greenie-gutses trying to storm your compound and eat your tasty, tasty brains? 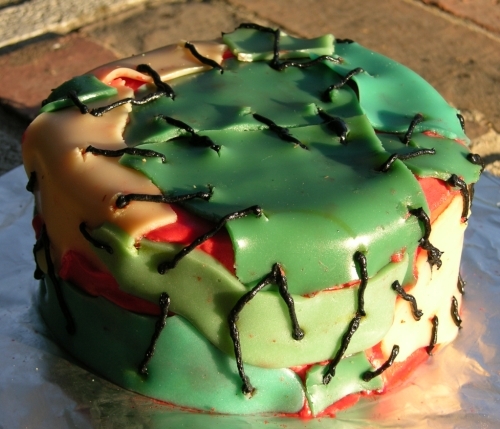 Well I did some experimenting and I’ve found a way for you to bite those undead back with Zombie Skin Cake! 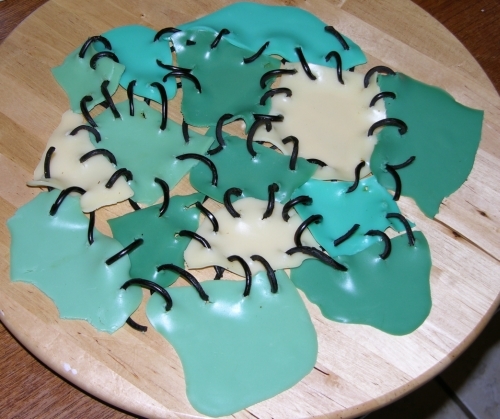 After accidentally discovering how to make something akin to flesh using a basic gummy recipe a couple of weeks ago, I immediately wanted to do something gross for Halloween. I took that gummy hand to my demonstration at the Houston Day of Sharing and it was a huge hit so I told several people I was going to do a zombie thing that week. I had a cunning plan that couldn’t possibly fail: last year when I was looking for green licorice laces (as opposed to twists) so I could use them as light strings along with candy-coated sunflower seeds on the Biscuit Brothers holiday cake, I was only able to find red and black laces in several stores all over town. So this year I decided I’d go back to one of those same stores and get the black laces, make some easy chunks of gummy zombie skin, and lace it all together. The problem was I went to all of those stores and not a single one had licorice laces. GAHHH. This delayed the project by a week while I got caught up with other stuff. Then last week I needed to make 3 dozen cupcakes for a Bake a Wish donation, so I figured I’d reserve a bit of batter from that and whip up a 5″ little cake just for experimental purposes. My husband said he’d seen licorice laces at Central Market, so I checked and found licorice wheels and decided that was as close as I was going to get, so I bought some. Put the water in a nonstick pot and add the gelatin powder. Allow to bloom (it will absorb all the water and become solid). Heat pot slowly over low heat and add hot water in 10ml doses until the whole thing is melted and liquid (will probably take 20-30ml of water total). Add the sweetened condensed milk and mix thoroughly. Heat until warm (NOT BOILING). Once you’ve got that mixed up, you can immediately use the baster to squirt some onto a heat-safe mat for some sickly-flesh-toned pieces. Take a bit out and put it in a separate bowl and add a tiny, tiny, TINY drop of green. Mix and use the baster to make sheets of that as well. Mix more from the pot in if you like to create different tones of the same colour. 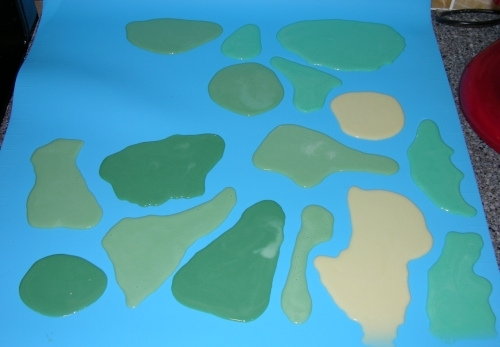 Repeat with blue (although it takes a bit more blue to get blueish-green, because the sweetened condensed milk has so much of a yellow hue). 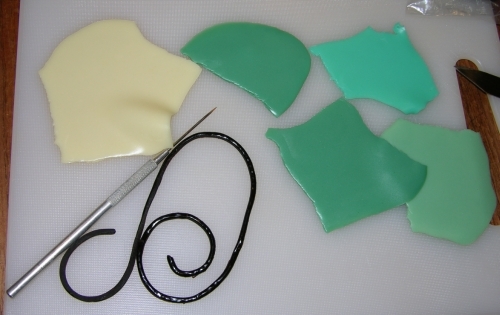 Variations in colour due to small amounts of foam or cross-colouring just add to the look. 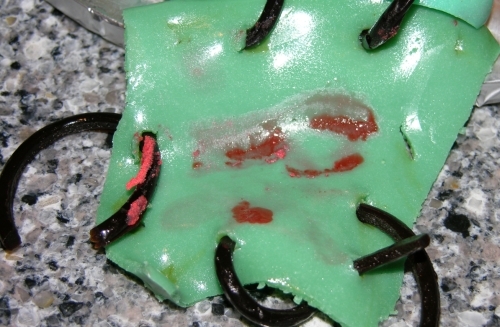 This turned out to be harder than expected; they split a lot, creating barbs and coming out fairly sticky. The first few stitches went fairly well although I quickly learned that I needed to put them further apart than originally desired, because the gummy was fragile and tearing. 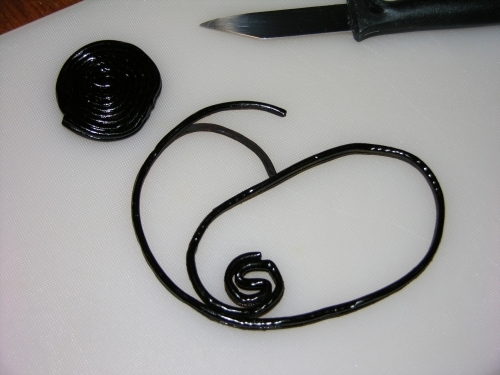 I worked and worked and worked, becoming increasingly frustrated with the licorice, both in splitting it and in finding the barbs were tearing the gummy and making the sewing much more difficult than it would have been had I found actual laces. Phew, that took awhile and was fiddly, but it looks cool! Insert copious quantities of swear words here. Then I decided to call it a night and put the whole thing in the fridge so I could go to bed. Undead Franken-porcupine or the product of the unholy union of a zombie and Pinhead? You be the judge. I left it to sit for a couple of hours while I worked on the accordion cake for Weird Al, hoping the skin would relax. It didn’t. So I got mad and brought out the Crafty Hair Dryer of Doom (which to my knowledge has never been used on hair, because I’m the kind of gal who owns such a device purely for it’s crafting potential and for whom a fancy hairstyle means a braid rather than a fast scrunchie-held bun). I aimed the heat at any point that was sticking out and softened it enough to make it BEND TO MY WILL. This also melted the buttercream underneath enough that it started oozing, which I’ll pretend was intended all along. Once it was all squishy, I stuck it back in the fridge to firm back up. After about half an hour I took it back out and was able to remove the toothpicks and all of the gummy skin stayed in place. Yay! I piped some black buttercream through a #2 tip between the holes as faux stitches, which worked much better since it remained flat (whereas the licorice was bulky enough to keep the gummy off of the cake in many places). 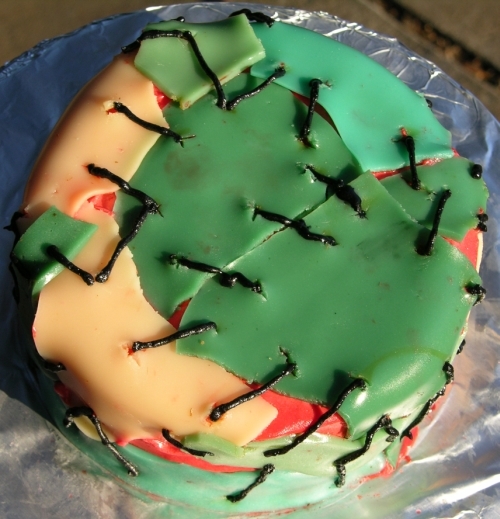 Behold: the ultra-gross mini cake of stitched-zombie-skin yuckitude! 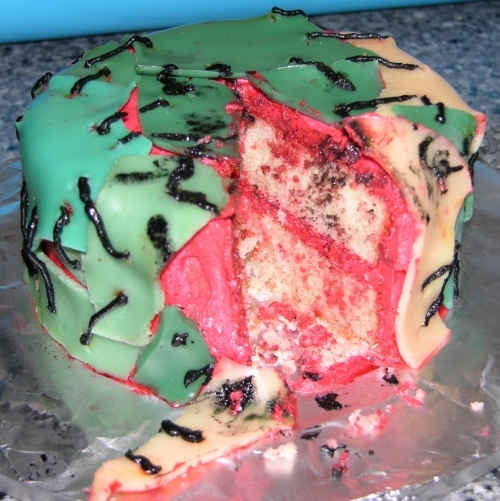 And you know what’s even more delightfully disgusting than the outside of a zombie-skin-blood-gross cake? Now that, my friends, is a bleedin' mess. Woot! For the record, the gummy is a bit of a pain to cut; it wants to push down into the cake instead of slicing. You need a really sharp knife and you have to stab through with the pointy bit and hold the cake as you saw. No, really. You MUST stab and saw this cake. Whether or not you pretend you’re at Dexter’s ultimate birthday party is up to you. I particularly like how wretchedly meaty the holes appear from the underside of the skin. Don’t bother with the licorice unless you can find the really skinny laces. Even then, piping faux laces is easier and makes for a flatter surface all over. Don’t chill the buttercreamed cake, or if you do, let it warm back up first. 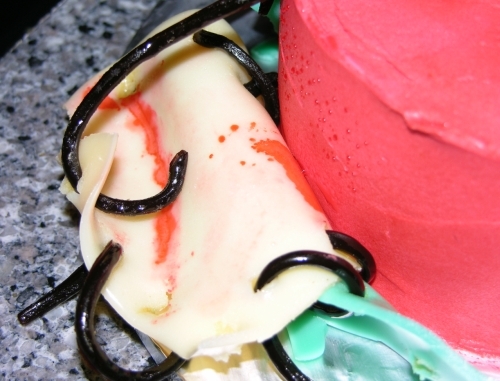 The gummy won’t stick to the cold buttercream very well at all. Freshly cast chunks will drape better, but even still, you might want to hit them with a hair dryer to warm them enough to flex to the cake’s shape, especially over edges. Cutting is a bit of a hassle but can be done. 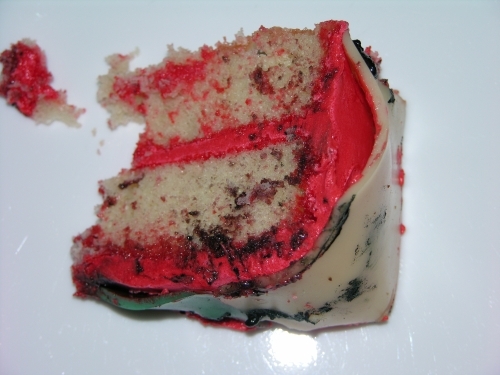 Taste-wise, the gummy has a pleasantly mild sweet taste and goes okay with the cake. 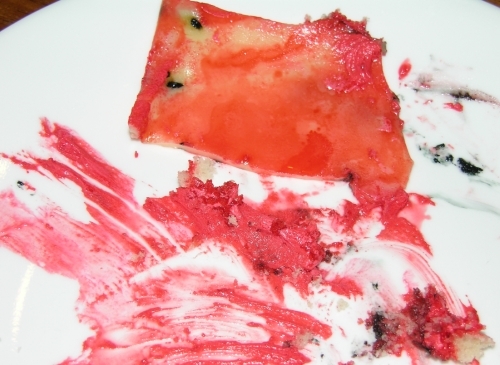 Texture-wise, the gummy is a bit weird on the cake. 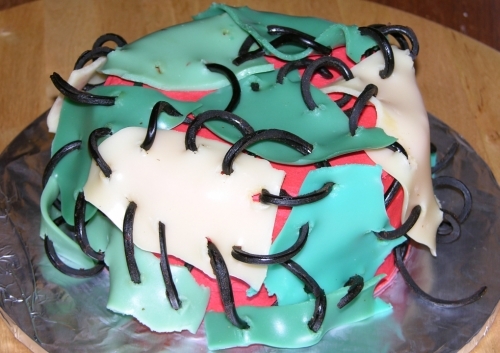 It’s like fondant that’s too rubbery. 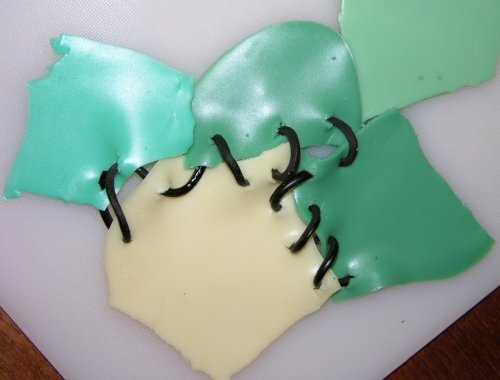 However, like fondant, it can be peeled off easily enough, and unlike fondant, it tastes good on its own. Kids will probably think it’s awesome and chomp down on it without complaint. You could definitely do this small-scale on cupcakes, or large-scale on big cakes. I have more experiments to do with fake skin, zombie skin, and some other Halloween ideas to come. Until then, experiment yourself and remember: if it all goes wrong and you can’t fix it, eat the evidence and nobody will know! 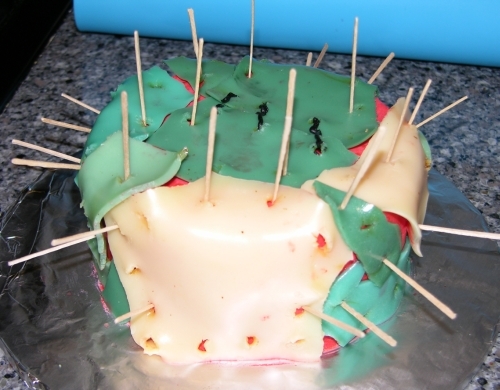 This entry was posted in Cake Decorating, Cupcakes and Mini Cakes, Experimental Techniques, Fancy cakes, General Freakishness, Gummy, My Recipes, Severe Nerdery, Sick and Twisted. Bookmark the permalink. 3 Responses to Zombie Skin: Let’s Bite ’em Back! OMG, that's disgusting. And awesome! I actually found this more entrteainnig than James Joyce. lol I love your ideas, I want to make some gummy hands and eyeballs for Halloween, have you done eyes yet? You always work out the kinks so well.